The fifth day of my list of my favorite things of 2017 and we have my favorite book of the year. 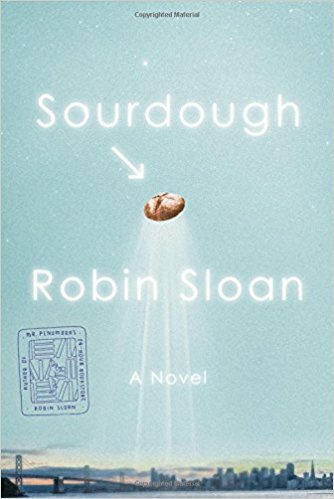 Sourdough: A Novel by Robin Sloan is a weird and eccentric modern tale about, well, I read it, loved it, and I'm still not sure exactly what it's about. In a good way. The story follows Lois Clary a software engineer who is stuck in the modern tech cycle in San Francisco as a software engineer at a successful robotics start-up. 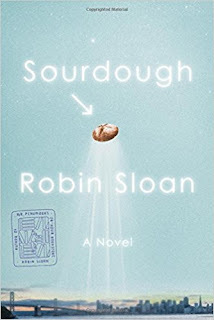 Living on takeaway food leads her into an unlikely friendship with a set of immigrant brothers who make a killer soup, and some amazing sourdough. When they have to leave the country for reasons unspecified they leave her a gift - the starter for their sourdough recipe. She has no idea how to bake sourdough, but soon learns. Then, among other things, she teaches her robots to help. The story goes places you rarely expect, and has a lot of passing comments about modern life (without ever feeling too judgemental), framed by a set of interesting characters and a healthy dose of wish fulfillment. The central character is going against the grain and searching for a different type of satisfaction than what is expected of her. It is a feeling I'm sure many of us can relate to, and you're rooting for her throughout. It is an unexpectedly strange book, and I don't want to spoil anything about the back half as you should go an read it for yourself! Suffice to say this is not ordinary bread. It's wonderfully written, keeps up a good pace, and isn't a long read. The audio version is also excellent. If you're an Audible subscriber or just an audio book fan it is worth checking out. Whatever medium you enjoy it in, it's well worth your time.